have become very obviously different cheeses. 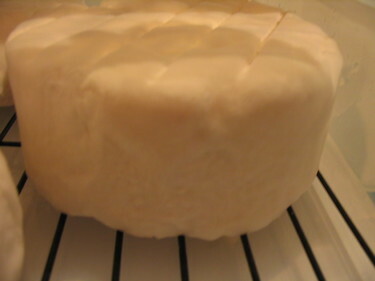 The camembert continues to develop its white fuzz while the washed rind develops a sticky orange rind. We will continue turning the camemberts and washing the washed rinds every 2 days for the next ten days or so. Then we will stop washing the washed rinds but continue turning them all for a few more weeks. After that we will wrap them up in breathable cheese wrap and store them in the fridge to ripen further. The difference between the 2 cheeses is even more obvious when you see them side by side. The wee little baby cheesies we started out on their path to cheesiness only just last weekend, have sprouted their wee fur coats and are well on their way to teenagehood (in the life span of a cheese, that is). Now is the time we start to treat our cheeses differently depending on what sort of cheese they are going to be when they grow up. Just as we would if they were real little boys and girls- they have different rules. We will leave the little Camemberts to do their own thing and get all hairy,only bothering them once every 2 days to turn them. While we gently wash the fur off all the the little washed rind cheeses on a regualr basis. For the rind washing, we use a sterile 4% brine solution inoculated with brevibacterium linens. The washing removes the white mould fur coat and replaces it with a sticky orange rind that smells a bit like feet, but which makes the cheese taste lovely. If you`d happened by the parking lot out the back of Planet Organic in the early hours of Saturday morning, I would have to forgive you for thinking that Cakes and I were waiting to buy some illicit substances or black market electronics. What we were doing was waiting to meet Ron, who was going to deliver 18 litres of organic, non-homogenized milk courtesy of Joe Mans of Vital Green Organic Farms, about 5 hours south of Edmonton. 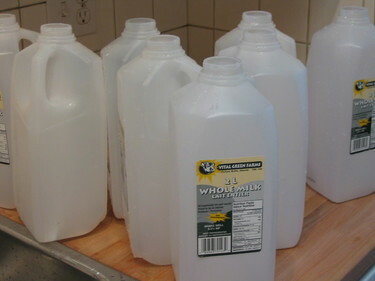 It all started last week when I picked up a copy of City Palate, and discovered that Joe sells non-homogenized milk. Homogenization is a different process from pasteurization, which involves heating the milk up to high temperatures to kill off any bacteria that may be in the milk. In its natural state, straight from the cow, milk fat hangs out randomly in the milk in little globules, and if you leave fresh milk resting for a while, they will all float to the top. In the homogenization process, the milk is spun very quickly in order to suspend the fat particles evenly throughout the milk so they don't rise to the top or clump up in random globules. It`s pretty hard to find non-homogenized milk around here, and it is a must for cheesemaking as the homogenization process that commercially produced milk goes through ruins the molecular structure of the milk and makes it useless for cheesemaking purposes. It also makes the milk much harder for humans to digest and contributes to lactose intolerance. But that`s another story. I called Joe to find out if I could get larger than usual quantities of milk for cheesemaking and was very disappointed to find out his farm was well over 5 hours from Edmonton. My daydream of a cozy trip out to the country with my husband to purchase milk for our weekend cheesemaking evaporated. Regardless, we got to chatting about how I learnt to make cheese and where to buy cheesemaking equipment and all things dairy. He is such a nice man. About 15 minutes later, Joe had kindly arranged for some milk to be delivered for me at the same time as his usual supply was dropped off at Planet Organic. He was so pleasant and generous, I agreed to send him instructions for the Camembert, a copy of City Palate some tips on where to purchase equipment and bacteria, and a sample cheese when it is finished. Cakes and I learnt to make cheese when we lived in Australia. We went to a weekend seminar at the Red Hill Retreat and had a stellar time. We learnt to make a number of cheeses, two of which are Camembert and washed rind cheese. We made both on Sunday. Though Camembert and washed rind cheese are made with the same process, they get different finishing treatment and the resulting cheeses are quite different. I'm not going to include the instructions for the cheeses on this post as they are quite lengthy and technical and would probably be quite boring to most people. If you'd like the instructions click here. The first step in making cheese actually starts the day before. I made a starter, similar to the way you make a sourdough starter, but using sterilized milk and the bacteria blend used to make this particular cheese. The bacteria blend we use is a blend of Lactococcus lactis lactis, Lactococcus lactis cremoris, Lactococcus lactis biovar, diacetylactis Leuconostoc and mesenteroides cremoris. The key components of this culture for our purposes are the first three bacteria, the last two are not really necessary. We buy our bacteria blends (and molds and rennets) here. This type of blend is known as a mesophyllic culture, meaning the bacteria like warm, but not hot temperatures (around 30c) and is used for soft and semi hard cheeses such including Camembert, washed rind soft cheese, cream cheese, Chere, Gouda, quark, sour cream and cultured butter. 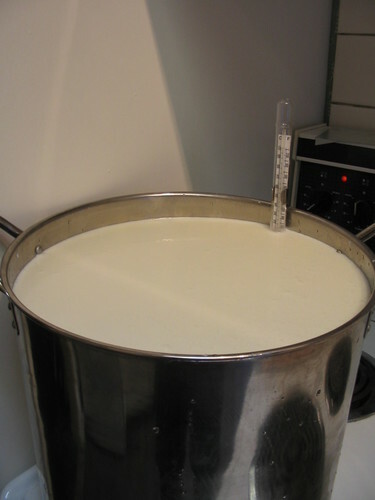 On the appointed cheesemaking day, Cakes and I poured all the milk into our cheesemaking pot and heated it up to the correct temperature. Once the milk reaches the correct temperature, we mix in the prepared bacteria starter and mold spores. 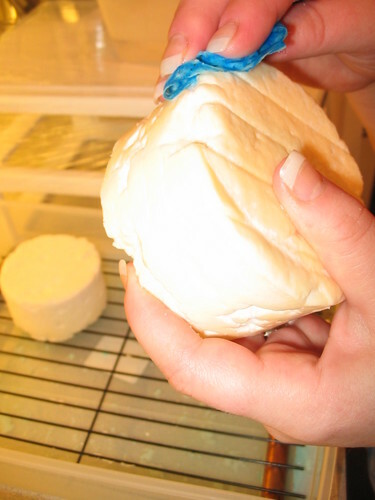 For Camembert, as with Brie, we use Penicillium candidum for ripening. 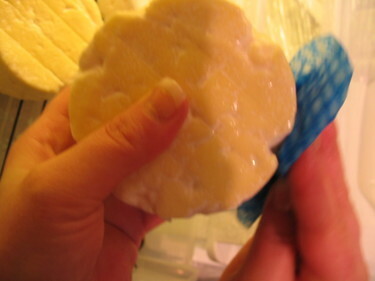 It is this mold that grows into the fuzzy white coat that characterizes those two cheeses. The next step is to add diluted microbial rennet. 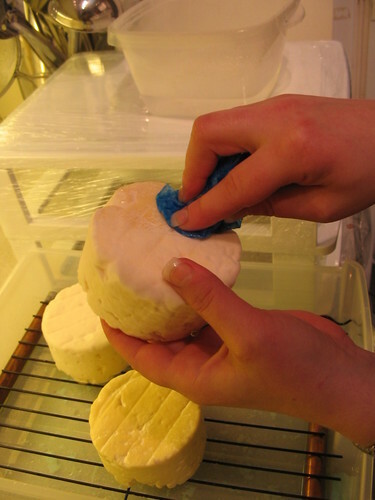 While the bacteria and mold contribute to the flavour and ripening of the cheese, the rennet is necessary to get the curds to form and expell the whey. Traditional rennet, which is seen as superior to vegetable based rennet, is made by killing unweaned, milk-fed calves and extracting the enzyme from their stomach lining. Vegetable-based rennet isn't really rennet at all, but certain plant extracts that may or may not coagulate your milk on any given day, and which are erratic and foul-tasting at best. 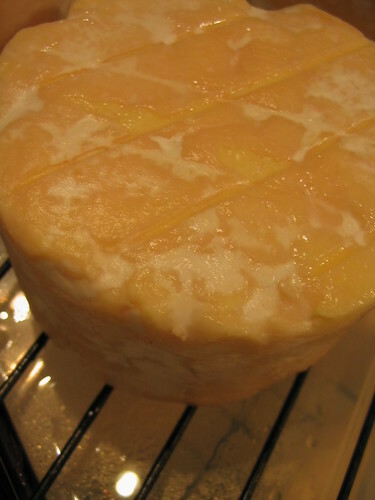 Since I'm not cool with the killing of baby anythings, especially not to make my cheese, we use microbial rennet. Microbial rennet is produced by bacteria who have been injected with the protein that makes the enzyme found in the lining of the calves stomachs. This allows the bacteria to produce rennet that is molecularly identical to that which is produced traditionally, but without the need to harm animals. This way, you get the superior rennet, without the killing of baby cows. 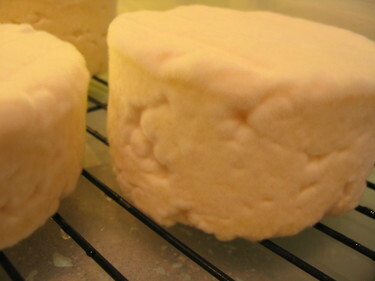 The addition of the rennet makes the inoculated milk coagulate into cheese curds. We let the milk sit in its little cheesemaking pan in a water bath designed to keep the milk warm and the bacteria happy, until the rennet does its work. Our system is not expensive or flashy. Our cheesemaking vat consists of a 20 litre giant clear Tupperware-type container ($12.97) nestled in a plain Styrofoam cooler of about 35 litres ($3.97). We pour 38c water in the space between the two vessels to maintain the temperature of the cheese while the rennet is working. After about a half an hour, we test the curd to see if it is sufficiently firm. We do this by inserting the tip of a large knife into the curd and pulling back gently to create a little gap. If the curd stays in one piece and clear whey fills the gap, we know it's time to cut the curd. 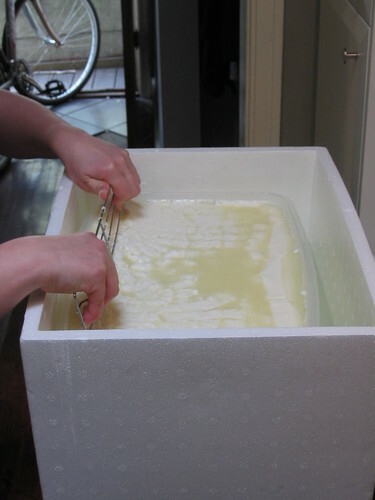 We cut the curd into smaller pieces to help the whey drain out and the milk solids further coagulate. The fancy fancy implement we use to do this is a cake cooling rack. We cut on three planes to get equal sized cubes about 1 to 1.5 centimetres square. The curds are left to rest for a further 30 minutes at which time we gently break them up again. Some people use ladles or skimmers for this, I find just getting my hands in there works better. Don`t worry about us having our hands in the curds. We are constantly sterilizing our hands and equipment. We turn the cheeses in their hoops every few hours and leave them to rest overnight. The next day we soak them in a sterile brine solution and set them to ripen in their little cheese house. The cheese ripening box is another fancy-pants piece of equipment: shallow Tupperware container with cake rakes set in the bottom to place the cheeses on. with a little water sprinkled on the bottom to keep the cheeses humid. We turn the fridge down low (about 9 to 13c) and let them sit in there, happily growing little fur coats. They will live there for the next 6 weeks during which time the Camemberts and washed rind cheese will get different treatment. We will let the Camemberts continue to grow their fuzzy white coats, but we will wash the other cheese daily with a solution containing Brevibacterium Linens, which will cause a sticky reddish orange crust to form on the cheese and give it an entirely different flavour. 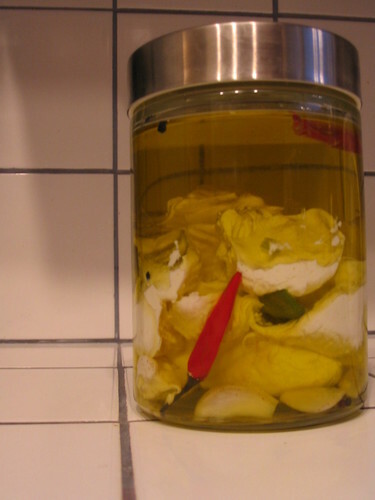 Brevibacterium Linens is the bacteria used to give Limburger cheese its distinctive sharp taste. If you smell the rind of the cheese too closely, it will smell like old stinky gym socks. But it tastes wonderful. I will be updating this post periodically during the next few weeks with photos of the developing cheeses. 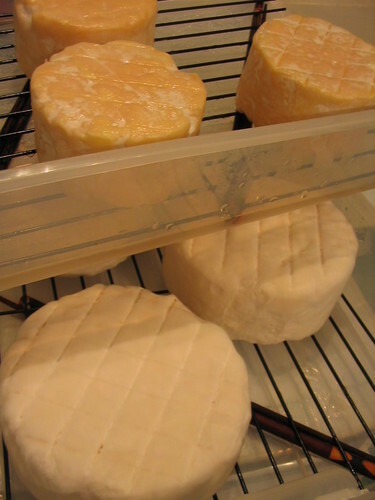 Ian and I took a cheesemaking course in March 2004 held at Red Hill in Australia (well, we lived there at the time!) from Neil and Carole Willman, two fantastic local cheese-makers. You can see photos of me and Cakes at the Willmans' cheese-making school here and here and here, as well as info on the courses that they offer! 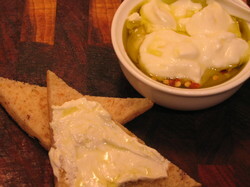 There, among the other things we learned, we learned that making your own ricotta is dead easy. Which is a lucky thing, as it is so much nicer than the day-old (or older) crap you buy in the store. Fresh ricotta is so totally unlike the store bought stuff: it is milky, and sweet and creamy...and, if yours is really fresh, warm to boot. Nothing beats a warm bowl of fresh ricotta, drizzled with honey and sprinkled with fresh toasted nuts or granola. 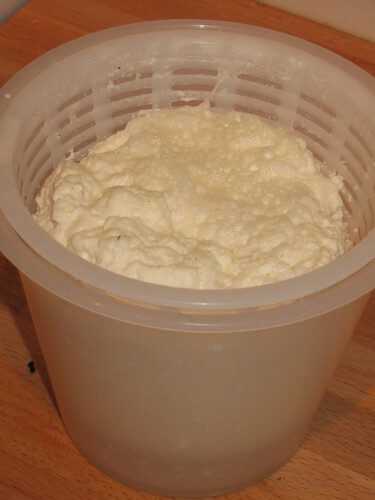 Real ricotta is usually made with the whey leftover after cheese-making. If you make cheese, you probably already know how to make ricotta, so the recipe I'm going to give you is for whole milk ricotta. It works with cows, goats or sheep's milk. Make sure you use full fat milk. If your milk is unpasteurized (unlikely in most of North America), you'll have to pasteurize it first. Again, I assume if your milk is unpasteurized you know a fair bit about cheese-making already, so won't bother with instructions for pasteurizing. I don't know if this works with UHT milk, if you try it out with that sort of milk, let me know whether it works. I suspect it won't, but that's just an amateur cheese-maker's hunch, nothing more. This recipe makes about 500 grams of ricotta. You'll need a dairy thermometer. A candy thermometer might work as well. You just need to be able to read from between 85 t0 100 degrees Celsius. yup. that's it for the ingredients. Gently heat your milk to 90-95 degrees Celsius. Do this very slowly in a heavy bottomed pot, or in a water bath inside a larger pot. Your milk should not stick or burn. It should take at least 20- 25 minutes for your milk to achieve the correct temperature if you start using cold milk. Mine sometimes takes 45 minutes. When your milk is between 90 and 95 degrees (not a smidgen under or over - if you've heated your milk gradually, your window of opportunity here can be as long as five minutes) quickly pour in the vinegar, and give one quick, brief stir - only to aid in the dispersal of the vinegar, but not to stir up the milk too much - or you risk breaking up your gorgeous big ricotta curds into tiny, grainy little ricotta curds. Remove the pot from the source of heat and let it set for about 10 or 15 minutes. Your ricotta curd should have risen nicely to the top, and will be floating there. Using a finely slotted spoon, gently ladle the curd into a cheesecloth lined sieve, or if you have some, into ricotta molds (Ricotta molds - like mine pictured above - are small plastic basket shaped molds meant to mimic the pattern of the wicker baskets that ricotta used to be drained in). 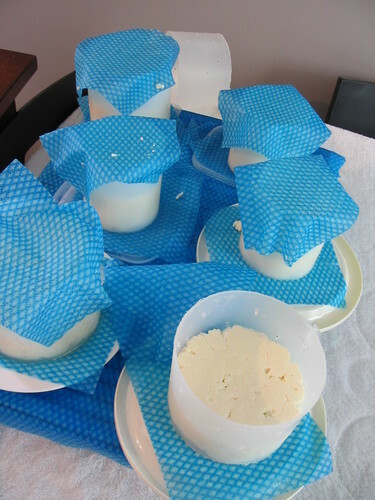 Cheesemaking.com sells some great disposable ones for super cheap. And here`s the best bit about that...you don`t have to dispose of them. You can use them over and over again. Not a bad deal when you consider that the fancy-pants ones like the one pictured above are 12 times the price! When ladling, try to keep the curd chunks as large as you can, the more they are handles and broken up the tougher they will become, which is exactly what you don`t want. You want cloud-soft moist and creamy ricotta. Not rubbery, grainy grocery store stuff! Use in your favourite lasagna or cake recipe or in one of these recipes! Now, go forth and ricott.